Noen som har sett denne? Er det noe tess eller? Ser jo rimelig heftig ut da. Følger med 3d briller å masse rart. Inspill noen? Har ikke sett den, men vurderer sterkt å kjøpe den.. Noen som vet om brillene kan brukes på vanlige dvd filmer..? Turn out the lights, don your 3-d glasses, and get ready for an AMAZING experience that is unlike anything you have ever seen in your living room! Let me start out by saying the glasses are top-notch technology...complete shutter 3-d glasses...no old-fashioned red and blue cardboard here! And for those of you that are amusement-park goers, darkride fanatics, and basically fans of blockbuster entertainment...you will LOVE this box set!! 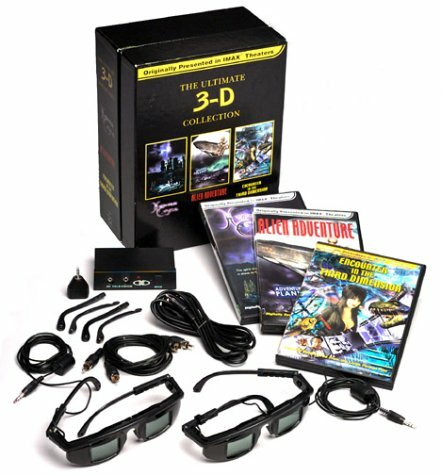 Start off with the introduction to 3-d with "Through the 3rd Dimension" and let your eyes relax and start focusing on how 3-d brings the illusion to reality! Although it's got some corny dialog and b-movie acting, you'll be treated to oldtime movies and clips from when 3-d was invented, some clips from theme park attractions like T2 and Mine Cart, and a whole simulator ride that lasts for a few minutes!! Next you've got "Haunted Castle", a 3-d visual darkride! Now ignore the pointless story and look at the incredible visuals because this is an adventure that truely brings you INTO the scene...once you step through the door after hearing the "devil" give you his offer of fame and fortune GET READY for breathtaking graphics, loud 5.1 surround sound, and twists and turns that take you through everywhere from haunted churches, spooky caves, and dungeons filled with 3-d realistic skeletons that are locked in cages that actually LOOK like actual cages...the depth is there and everything!! Over 25 minutes of dropdead 3-d visuals and maybe 10 minutes of lame filler...still an AMAZING RIDE!! And then last but not least is "Alien Adventure" where once again the story is stupid but the actual simulator rides are INCREDIBLE! You are treated to 4 different rides at this new high-tech amusement park...an Artic ride that shoots you down a crazy tobaggan ride through the snow...a Magic Carpet ride that takes you through a magical journey inside of dark tunnels and Indiana Jones-type passageways complete with incredible 3-d effects and splendid music...a simulator ride on a kid's roller coaster that he built in his room complete with toys, loops, MASSIVE details, and lift hills with realistic inclines and stomach churning drops...and finally an underwater ride that is complete amusement park real! Starting in an actual amusement park complete with lights, a ferris wheel, carousel music, and signs on both sides of the car! After dropping into the water you'll experience a trip through a pirate ship, bubbles that can FEEL, a tiki island with a roller-coaster-like hill, and 3-d DETAILS that bring you into the scene...there is so much amazing visuals on these dvds that you can watch them over and over and see different little details you missed before!! PLUS all in computer-generated 3-d theme park style!! It's quite an amazing journey and the glasses just make it even better...if you lift them during one of the rides and take a look at the screen you'll see just how flat the regular tv screen looks! This is a 3-d adventure that everyone out there should experience and it's somewhat pricey but the visuals you'll watch more than make up for it!!! Pick this up and get ready for an INCREDIBLE 3-D RIDE EXPERIENCE!!!! Hvordan er det for "migrene folk"...? Hvilken oppdaterings hastighet har brillene..? Fann noko info om det på denne siden..... http://www.frostbit.com/Catalyst/syncdouble.html der du også finner link til denne siden http://www.frostbit.com/Catalyst/flickerbad.html som det står meir detaljert om blinke hastighet og grunn til hastighet. Har sett "Haunted Castle" på IMAX, der brukte de pappbriller med brått og rødt glass, noe som funket helt greit. Jeg syntes historien var litt dårlig, men det er ikke det som er det viktigste med slike filmer. Den har en berg og dalbane tur mot slutten, som er ganske kul. Bestillte boksen nå!!! Blir dyrt men det får bare være!! Kjøpte fra dvdstrax. Dem får in om ca 2-3 dager noen grøssere som støtter disse 3d brillene. Spennans!!!!! Har du fått pakken no _LarZen_. Hey, nei. Dem den ikke på lager. Jeg avbestilte den og kommer nok til å bestille ifra dv-depot istede så slipper jeg tollen...spare litt penger! hehe. Hørte senere av en kamerat at han trudde at IMAX hadde sluttet i oslo. Jeg har Haunted Castle og kan får i alle fall ikke noen 3D-effekt med fargebrillene. Har tidligere sett 3d både på andre filmer både på tv og på IMAX. Kanskje det ikke holder med en 32" TV? Eg trur det er stor forskjell på fargebriller og briller som opner/lukker seg (kanskje eg tar feil). Vi har ein storskjerm på jobben med sånne briller når me skal sjå på konstruksjoner +++ og det virker heilt enormt, derfor eg har lyst å kjøpe dette settet. Har jo ikke hørt noe mer... hva med en liten anmeldelse? Huff... litt skuffet nå. I bruksanvisningen til filmen stod det at brillene kun fungerte på vanlig CRT TV'er og monitorer. Testet med projen igår, og det ser ikke lovende ut. En tusenlapp rett i dass. Dette som kunne vært såå bra med proj, og så kan det kun brukes til TV'er? En vits, om enn aldri så tragisk. Greit at man får tre filmer da, men de er ikke sååå kule uten 3D effektene.